We won’t have final 2015 numbers until the 3rd week in January of 2016, but by all accounts the SW Florida real estate market is going out with a bang! November statistics were recently released over the Holidays and median sales prices of single family homes shot up 16.1% over last year. 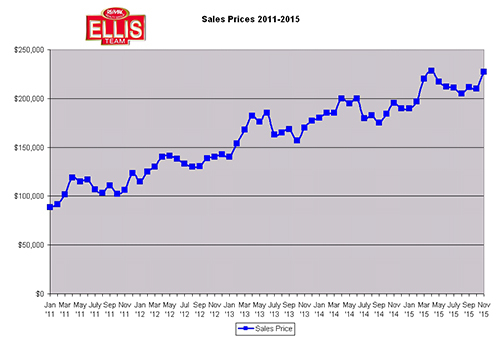 The November median sales price sits at $227,000. The averages sales price shot up 13.1% to $304,691. Good things are happening in Southwest Florida. Businesses are hiring, people are moving here, and real estate is booming. The Lee County School Board is having a hard time finding teachers to fill vacancies. This tells us that the school system is growing and people are moving back because the jobs are here. 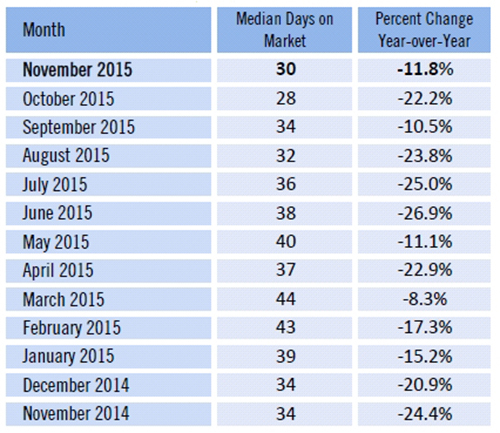 The time it takes to sell a home also fell 11.8%, down to 30 days on market. So basically the numbers suggest prices are rising and should you decide to sell your home you should be able to within 30 days. This is good news for home sellers. So why doesn’t every home sell in 30 days? Of the homes that do sell, half sell quicker than 30 days and half take longer than 30 days. Then of course there are the homes that never sell. Those homes are not included in this calculation. Homes priced at the lower end tend to sell quicker because there is more competition. More buyers qualify at the lower price ranges. Additionally you have investors that compete against home buyers in those ranges. As you rise in price you lose buyers from the available buyer pool. Simple economics are in play here. As interest rates rise it squeezes home buyers as well. A 1% rise in interest rates decreases a buyer’s purchasing power by 11%. So if a buyer qualifies to purchase a home up to $300,000, they now only qualify for $267,000. The payment is the same for both mortgages though. They just qualify for less because the rise in rates made the lower amount financed cost as much as the higher amount financed today. This is precisely why we tell buyers now is the time to buy. Rates are rising now and are expected to rise for the next few years. For the same payment, you will buy less home next year than you can this year. And add to the fact home prices are going up, not down, you get caught in a double whammy. If you don’t like the available selection now, you might hate it next year. Inventory levels are down 5.1% from last year. Buyers are in competition with other buyers for the best homes. If a seller is priced correctly, their home should sell, so the buyers aren’t really in competition with the seller. One way to beat out other buyers to Hot new listings is by signing up on www.LeeCountyOnline.com Listings are updated from MLS every 5 minutes and we have all the shareable listings. This is important because some of the other platforms don’t update regularly. There’s nothing worse than searching listings and missing out on a good one because it wasn’t there, or missing out on a diamond that comes back on the market and missing it because the system you’re using doesn’t have current data. In fact, our system will also email you new properties that match your criteria along with price changes and back on the market listings. And of course, there’s no substitute for speaking with a knowledgeable agent that cares for you. We’re not here to sell you anything. You want to buy. We want to help you find what’s right for you. It’s really pretty simple. If you’ve got questions, give us a call at 239-489-4042 We’re easy to talk to and never high pressure. We listen to you and find you what you’re looking for. And, we’ve got some great tips on things to think about too. Good luck and Happy House Hunting!! Posted in Cape Coral, Cape Coral Real Estate, Fort Myers, Fort Myers Real Estate, Southwest Florida Real Estate.Tagged 2015 SW Florida Real Estate Market.